Many thanks for keeping up with the blog and popping off! But you may have noticed there's been no new posts for a month now. Truth is, my new larrynemecek.com FINALLY went live a couple weeks back— new look, new layout... and a new location for the blog! All now on Wordpress instead of Blogger, if that means anything to you. 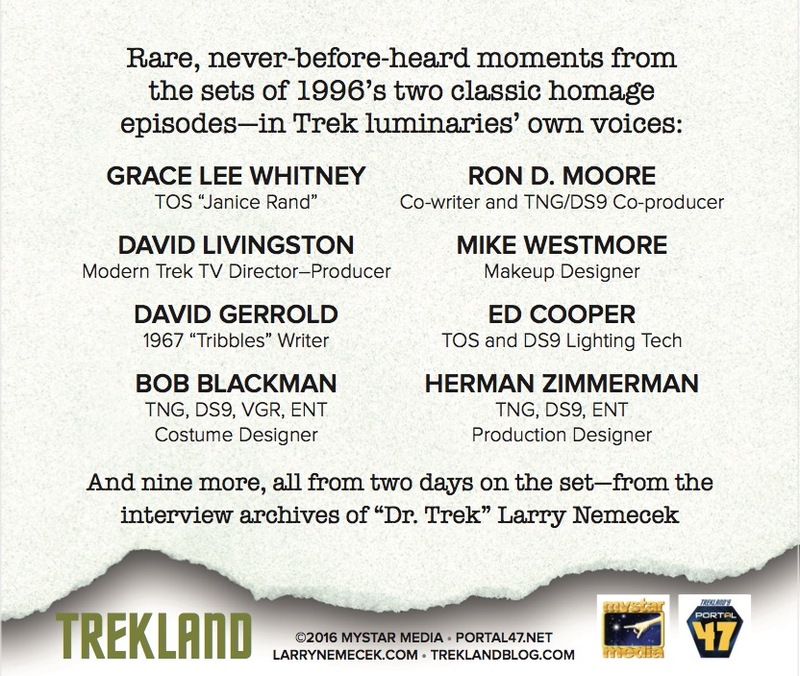 So, kindly point your browsers and redirect your RSS or other subscriptions now to www.larrynemecek.com/feed. 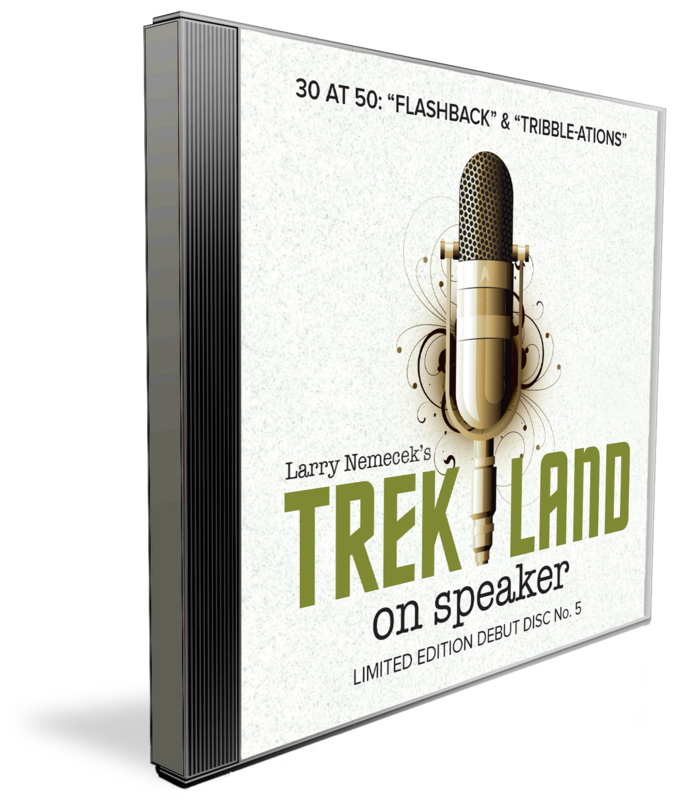 The nominal TREKLAND actual blog URL is now simply larrynemecek.com/blog. 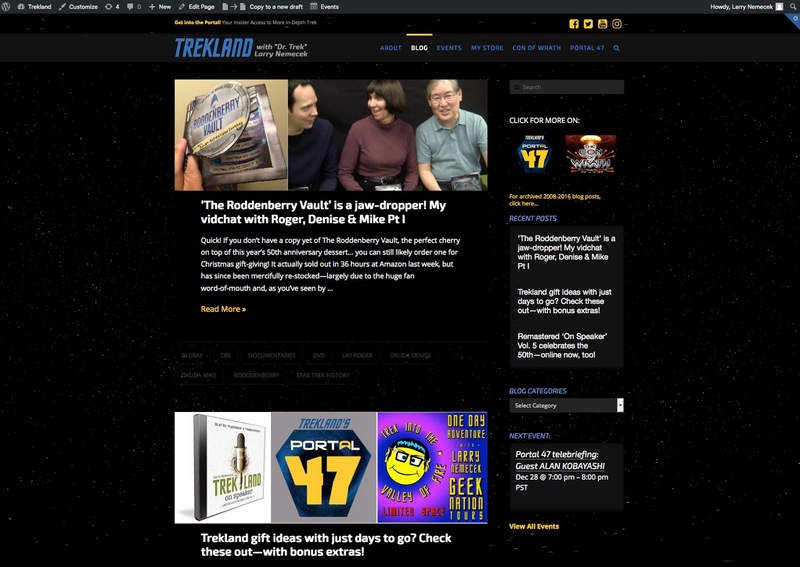 But don't worry: Eight years of Trekland posts and vidchats are not going anywhere. I will be transferring most all the old posts to the new platform as the months go by. For now, though, this original 2008-2016 site will stay on as a fully-indexed legacy archive, and "secret passage" links will be posted on both ends, oneto the other—as you can see in the margin here. Occasionally, Star Trek has this thing about its movie premieres, and infamous dates that will live in infamy. And if TMP's Dec. 7 was one, First Contact's Nov. 22 was another. Premiere dates are hardly a complete snapshot of a film, of course, but it's what the ticket-buying public most identifies with. Thankfully, neither of those infamous dates were omens of what was to come on screen—especially this one. 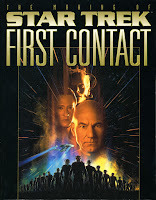 First Contact was the second of the four TNG films that I saw and covered up-close, and have strong memories for above and beyond the critical and fan reactions that were mostly favorable—even as in hindsight, we can see the demand of bid-screen billing and process molding what we'd always seen in the family on a weekly basis for seven years. 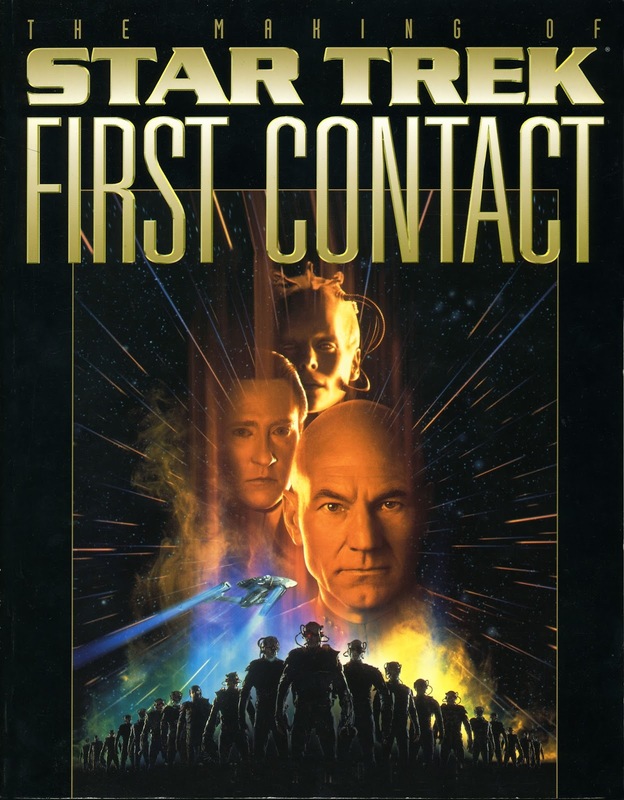 And even as, sadly, the awesome book I wrote most of the BTS half for, Titan's The Making of First Contact (above), was only available in the UK and some European, non-US markets. We all have our personal memories--mine was seeing those first sets built, posing for an unused book photo on the deflector dish with the bird feeders (LOOK IT UP!) the day of that shooting, and my one and only time to hit Hollywood's famous Pink's hot dog stand near midnight with our Trek colleagues and office friends after the cast/crew screening at the lot. Still, everyone loved the Borg, and we loved seeing them given their due in a big-budget, big screen upgrade. 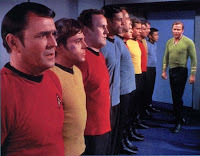 AND we had the "nextgen" of the Enterprise PLUS our first Starfleet all-CGI ships! Oh, and a great, enjoyably-led film by Frakes in his debut on big screen.... and a great story with great cameos by Picardo, Philips and Schultz... and great featured performances by Cromwell, Woodard and Kriege. Though it should be noted, compared to the Bad Robot Kelvin movies, these were hardly produced even on a '90s Star Wars scale. In that vein, for my bit in piling on to the celebration online everywhere today, here's a rare shot at the cockpit of the historic Phoenix warp test capsule (below). 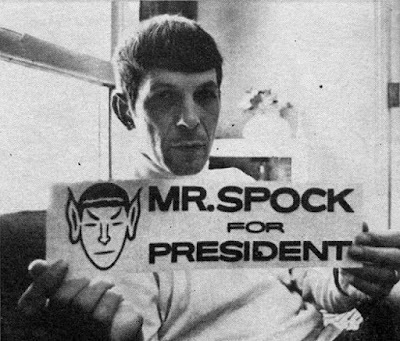 Yep, that's it.Canon-wise, "Live long and prosper" all came from this! Anyone note the prop from another cult fave? I didn't know Ron Thornton that well, although he was certainly kind and generous and supportive of me in my writing and projects. I may not even have any pics with him, back from the time of no cameras-on-pagers known as The Nineties. 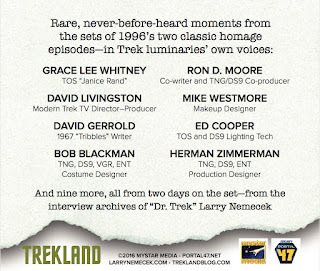 Following his passing Monday afternoon after a long illness, you can read much more by his Trekside colleagues Mike Okuda and Daren Dochterman here at the excellent remembrance startrek.com ran today... where I pilfered the above photo. There are many more reflections on Ron scattered around Facebook by both peers and proteges. But with his far-too-soon passing on Monday, it brings to mind how much our world has changed, how much storytelling capability on television has changed.. and so much of it due to Ron. For all you kids raised on cheap n' easy CGI* you do on your own laptop... Ron was literally the one who brought the magic of new digital effects to weekly TV. Ron was a hands-on visual effects guy, and has plenty of credits to prove it. But by the time he'd co-started Foundation Imaging and it bled over into Trek work where we needed to interact, I saw him as head of his companies, mostly. But in that regard Ron was not only always glad to see and help me, but he made it possible for the CGI Trek journalism revolution as well. Beginning with the original UK Fact Files—and then our official Communicator mag and then the US Trek mag that Fact Files content became in the US—those digital ship shots were no longer a high-dollar wish-list item: Ron made it possible to supply us with the angles and 3/4 views of elusive CGI ships that Trek techheads were so hungry for, after mourning the phase-out of those beautiful, actual miniature ship models. True, in the early years we used to talk about how all the Foundation effects on Babylon 5 were "so CG-ey"—that is, overly aliased, and obviously below the quality of shooting actual models. But the evolution was speedy, for the important thing was that his breakthrough render farm concept allowed common PCs of that time to handle the high-data demands of CGI processing quickly as a networked unit. So speedy, in fact, that even the supervisors on state-of-the-art Star Trek, one by one--even, by DS9's last season, skeptic Gary Hutzel too—became convinced that CGI would be not just doable but respectable on TV limits... both in money AND time. Even for Star Trek. It's ironic to me how today there's as much CGI digital work on TV now that has nothing to do with space battles—invasive viruses and infections illustrated with graphic motion on every procedural show, massive Earthly landscapes on global adventure shows, Earth-bound superheroics on all the superhero fad series... and it all kicked off with Ron finding a way to make it work on the small screen in the early 90s. Excuse me. I know I must have a great shot with Ron here somewhere. I'm long overdue to dig it out. *Just in case you need it: CGI is actually the acronym for "computer-generated imagery." Hoosier Trek buddies? Starbase Indy THIS weekend! What a way to close out the 50th anniversary—with a visit back to all my Trek friends this post-turkey Thursday at Starbase Indy! This old-school, fan-run hotel con sure has lived long and prospered since we first were invited back during Enterprise's reign, and then a couple more visits since. Long the passion of chair Kim Huff, this year she's handed off to Melissa Kocias and I can't wait to see how it's grown. Also, this visit I have a specific Enterprise in Space panel to share updates on our non-profit global orbiter-borne space program for students—and I'm excited to finally MEET and have onsite our EIS chief engineer, Fred Becker! Table-side, I'll have another Portal 47 sign-up bonus and even a prize drawing... plus the latest On Speaker CD edition for the 50th. And—I'm also looking forward to talking Trek and Starbase Indy Saturday on the local WXIN Channel 59 morning show! Thank the (Vulcan) gods for the Internet. November 4th is not only the day to say "Happy Will Rogers Birthday! "—yes, there is a physical as well as a philosophical link there—but this year it's the 20th anniversary of DS9's delightfully and awesomely monument anniversary homage show, "Trials and Tribble-ations." Now this is a valentine to fans. I mean, it's pro-Trek's own fan film, is what it is. Look, even if you're not a DS9 fan or even an original series fan—you must get familiar with this episode. It's the "Charlie Brown Christmas" of Trek that transcends everything else ... and when it was made, I dived in to do a two-day set visit for the best bits for a TEN-page feature for the official Communicator magazine (before I was editor)... and wound up helping make a little history myself. In fact, I've long said this was the most effortlessly fun writing project I've ever had—it's both a diary and an interview digest. That shoot was simply a magical time ..as magical as the final episode preserved on film turned out to be. When I am live at conventions, as with Northeast Trek Con or Starbase Indy, you can grab one from me there.. as you could since its debut at STLV. Hello Albany: Trekland finally hits the Northeast! All right! I can't wait to hit the Northeast for, naturally, Northeast Trek Con coming up Nov. 11-13, since I've never had the chance to visit in the region—as either a con guest or as a tourist, or both. One exception: that short 2005 visit to the New Voyagers/Phase II sets; otherwise, I've never been east or really north of New York City. Until now—or Veterans Day weekend, that is...and the debut of this new convention, an old-school fan-run charity throwback but with a shuttlebay full of great actor and behind-the-scenes guests (see Facebook and Twitter, too, for more late-breaking info). I hear that a lot of Trek fans in the Northeast still may not have heard of this start-up con—so please take notice! There's still plenty for ticket-buyers and room-renters at the Albany Radisson. And I would love to meet as many new fans from this end of the country as I can! I want to thank Jerry Silber and his team for having me, and what a great a lineup—with even more on Skype. Just check it out! I get to bring the Portal 47 word to the Northeast, show off the Dr. Trek Show for The Con of Wrath, and evangelize about Enterprise in Space as well. In fact, I'll be getting an important early "blogger" on camera for the doc who was at the Ultimate Fantasy in June 1982 just ahead of this weekend, so I'm doubly excited for that. 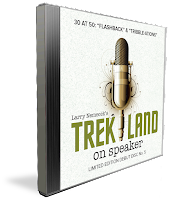 5 pm— Trekland Between the Cracks: 5-0 Fever and Beyond: The latest update to my regular Trek hour as we go "beyond" the 50th and "discover" some new ways to look at its past, present and future... via my slideshow of in-jokes and insights and your Q&A, too! 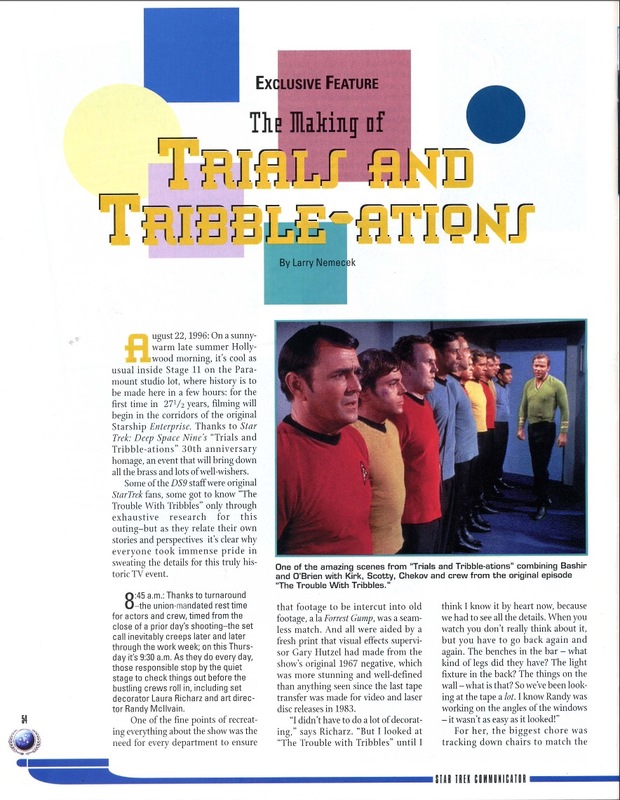 9 pm — Captions Log: The home edition of my Trek magazine column, where you come up with the best caption to a blooper photo, and the audience might just judge you a prize winner! (And yes, this is late night for a reason...). Noon— Adam Nimoy Skype chat: And I do the moderating! Have you seen For the Love of Spock yet? 3 pm—Voyager panel with Garrett Wang and Bob Picardo: Well, I was on the lot, too! 7 pm — Enterprise in Space, 2120: Hear the latest on this global non-profit orbiter program launching 100+ student STEAM projects and partner-industry demos on the first real Enterprise in Space, sponsored by the National Space Society…and how can help and get involved, too. 10:15 (approx.) 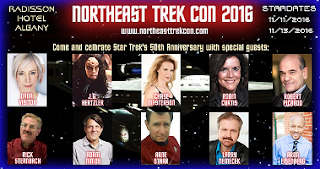 — The Dr. Trek Show crowdfunder event for The Con of Wrath: Finally, in the Northeast! Your $20 support at the door gets a screen credit on my documentary PLUS two hours of prize trivia, rare Trek video, and sneak peeks with George, Nichelle, Walter, the late Harve Bennett, and more. (Here's the Facebook event page, so click in or gete more info). 11 am — The State of the Trek forum: Bring your opinions and your vents—but be prepared to not only share but listen to others, after I get you started.